I’d recently been sent a parcel of goodies from Caprera which included a bottle of pumpkin seed oil. The 250 ml bottle of virgin pressed unrefined pumpkin seed oil, from Scarlett & Mustard, tastes rich and nutty; it makes a fabulous dressing. The seeds are grown and pressed by a group of Slovenian farmers and are packed full of vitamin E.
Caprera is a new online marketplace dedicated to good quality food produced with love by small independent UK artisan businesses. Caprera acts as a one stop shop, enabling people to order a number of products from different craft producers and receive them in a single delivery. The producers’ stories are an important part of the food experience and are all related on the site, should wish to know more. There are also some great videos from the producers explaining their craft. I particularly enjoyed the two minute vimeo from The Seriously Italian Company who make fresh pestos and pastas in London. As a customer, it feels like an online delicatessen with many of the items you’d expect to find there. The site currently offers around 200 products from oils and seasonings to cheeses, jams & preserves, beverages, confectionary and more. As well as the pumpkin seed oil, I was also sent a bottle of hand crafted Surrey Garden Cider and a pack of handmade vanilla fudge from Meg’s Cottage in Bradford on Avon. With Christmas fast approaching what could be nicer than a hamper of artisan food and drink goodies. Caprera has a seasonal Flavours of Christmas Hamper for the festive season, replete with cake, biscuits, chocolates, jam, chutney and more. Other gift hampers on offer include: Dinner Party, Afternoon Tea and BBQ Essentials. I know which one I have my eye on. The quinoa bowl was comforting, nutritious and delicious. Unlike cereals, quinoa is a complete protein, so these bowls of goodness provide a balanced meal. The dressing made with the pumpkin seed oil and balsamic vinegar along with a few other ingredients was exceptionally good and I shall be splashing it around any number of creations yet to materialise. The complementary colours of green broccoli and orange squash were a feast for the eye as well as the palate. A scattering of toasted pumpkin seeds provided a welcome crunch. Bring on the quinoa bowl I say. Place the quinoa in a pan with a tight fitting lid. Cover it with water and bring to the boil with the lid on. Allow it to simmer for 3 to 4 minutes, then drain off the water and rinse the quinoa. Cover with twice as much water to quinoa, bring to a gentle simmer with the lid on and allow to cook for ten minutes. Turn the heat off and leave for a further 5-10 minutes, when you should have a fluffy pile of quinoa. Mix the squash pieces with the olive oil, chilli, turmeric and salt and roast in a hot oven for about 20 minutes by which time the squash should be cooked and a little caramelised around the edges. Meanwhile steam the broccoli for about 5 minutes or until just tender. While everything is nice and hot, divide the quinoa into two bowls. Place the squash on top along with the broccoli. 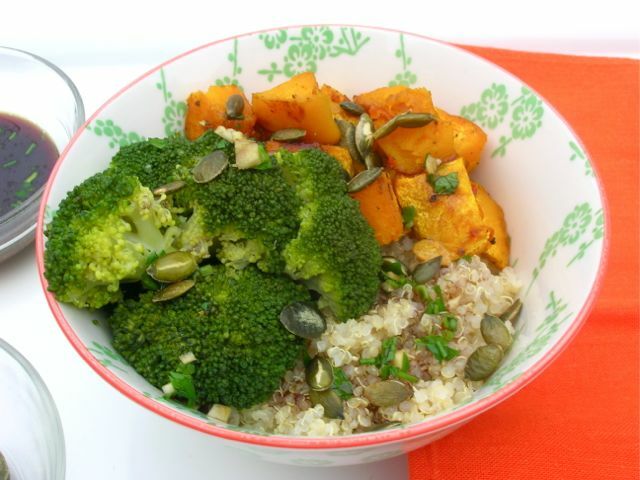 Scatter the pumpkin seeds over everything and spoon on as much of the dressing as you like. It's not strictly necessary to par-boil the quinoa, but cooking it this way gets rid of any soapy taste and gives a fluffy result. I love adding quinoa to my porridge, salads, or as a side dish for dinner. The pumpkin seed oil sounds interesting. I’m going to try your recipe, as I’m trying to eat more healthy and it sounds wonderful! Thank you for linking to my berry quinoa porridge! Thanks Diana, I hope you like it. We eat a lot of quinoa, but I’ve not yet tried it in porridge. I do like the idea of quinoa bowls and the pumpkin oil sounds delicious, especially with the pumpkins seeds in the salad too. I’m always making mini resolutions to eat more healthily and this would be a meal that I’d love. Thanks Corina. I’m a bit of a dairy addict, so it’s really nice to have something relatively simple like this that is delicious with no need for dairy. I love quinoa and serving it like this in a gorgeous bowl with lovely veggies makes for a perfect lunch. Interested to taste the pumpkin oil, not had that before. Thanks Laura. Pumpkin seed oil works really well as a salad dressing, but I’ve also used it in savoury muffins to good effect. This looks delicious Choclette! So virtuous! I’m a big fan of buddah bowls. There is something comforting about wrapping your hands round a bowl and digging in! That looks and sounds delicious! Lucky you to get such fab things to try out. Yum. I hope you are on the mend and feeling a bit better. Mmm this sounds rather lovely! I’m intrigued by this pumpkin oil! I love the 3 different options you have here! This looks like such a nutritious and yummy dinner! Pinned! Thanks Sara. It really was and I should do it more often. Oohh pumpkin seed oil – that’s a new one for me. Love pumpkin seeds too. Pumpkin seed oil is really nutty and delicious Heidi, but Caprera have lots of other delicious things on offer too. A quinoa bowl is a great idea! I’m so intrigued by the pumpkin seed oil. Pumpkin seed oil is nutty and delicious Jessica and it seems to go particularly well with balsamic. Quinoa bowls are the perfect meal for the cold days of winter. Love the addition of pumpkin for flavors of fall. Looks delish! Nice!! Pumpkin seed oil!! I love making quinoa bowls – so nutritious! I love all the ingredients you have used! I have printed and this will be made for my lunches next week!! Some of my favourite things in here and I do love a bowl – something very comforting about them! My thoughts exactly Chris and it’s good to know that simple food can be just as delicious as grander fare. Oooh. I love the sound of Capera foods. Must check them out. It’s well worth a look Bintu. Lots of delicious looking artisan fare from small British producers. So nutritious and delicious as well! Quinoa lives in my pantry nowadays. 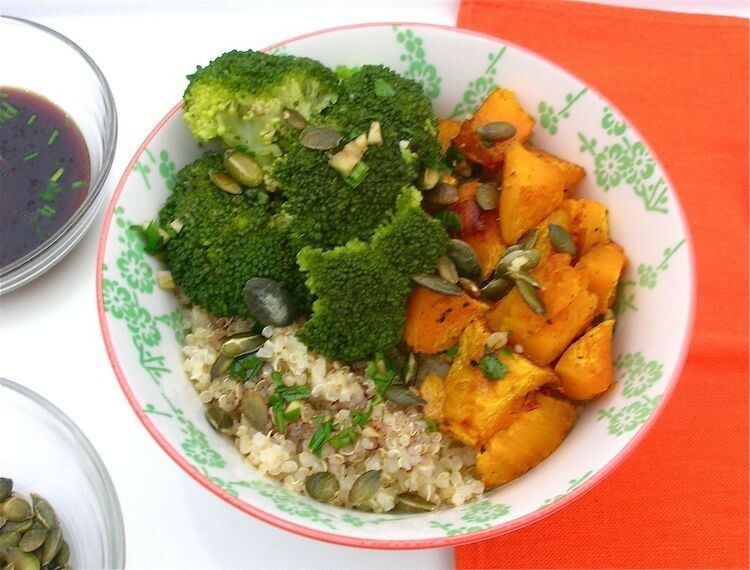 I love what you did here with the pumpkin, beautiful and healthy ! Thanks Florentina. We used to buy organic quinoa in bulk, which was great. Sadly we lost our supplier and now have to buy it in measly expensive packets. I’ve been hearing more and more about bowl meals lately, as well. Your example looks perfectly healthy, delicious and practical. No wonder they are catching on! Great job with this one. Thanks Janie. Pumpkin seed oil is really tasty. I’ve been using it for years. It’s also quite fun because of its unusually dark colour. Great recipe. I’ve featured it in this week’s Meat Free Mondays. The roundup is now live. Thanks for submitting, oh and yummed, stumbled and pinned. Thanks Jac, I shall be over to take a peek later on today. This look delicious and a wholesome break from all the heavy food that comes with this time of year. Pumpkin seed oil sounds wonderful too! That looks great and I love that it is quinoa instead of rice! I have never tried pumpkin seed oil but it sounds interesting! This has bowl has some of my favorite ingredients and I love the contrasting colors and textures of the dish. Thanks for sharing this as it makes a great meat free meal.